His Highness Sheikh Mohammed bin Rashid Al Maktoum, Vice President and Prime Minister of the UAE and Ruler of Dubai, toured the Airbus plant in the German province of Hamburg. Sheikh Mohammed's four-stop tour of the giant factory premises started in the department dedicated to the assembly of the basic components of the short- and mid-range A320 commercial aircraft. The Hamburg plant is specialised in manufacturing this type of planes along with the double-deck, wide-body, four-engine jet airliner A380. Sheikh Mohammed was accompanied during the tour with Sheikh Ahmed bin Saeed Al Maktoum, Chairman of Dubai Civil Aviation Authority and Chairman of Emirates Group, and Khalifa Saeed Soliman, Director General of the Dubai Protocol. 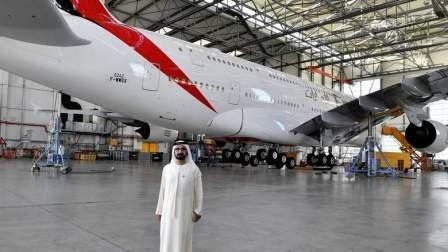 Sheikh Mohammed was shown around parts of the structure of this modern generation of Airbus dedicated to Emirates, the world's first company to acquire 40 per cent of Airbus A380's production. Sheikh Mohammed was posted during the third stop on the process of installing and executing the state-of-the-art interiors of the jumbo plane in terms of colours, and its classes designed with clean ivory palette, and bronze and wood grain accents. In the fourth stop, Sheikh Mohammed got firsthand experience of the mechanism of work followed by the company's specialists in painting the aircraft with the colors of Emirates, whose fleet now includes 96 A380s, and is expected to reach 100 by November this year. In 2025, the number of A380 planes at Emirates is set to reach 142 as part of the bilateral agreement between the two companies, which will make Emirates the world's first to own this large number of the jumbo plane. During the tour, Sheikh Mohammed was briefed on the interior design of the A380 fleet and its exterior painting by Andreas Fehring, Head of Airbus Plant Hamburg, and Andreas Foerster, Chairman of Airbus Group. The two officials said that the Toulouse-based AeroSpace and Defence Industries Association of Europe, ASD, is producing 14 A380s annually as manufacturing and finishing of one plane of this generation requires one full year and costs US$400 million. They affirmed that Emirates is the Airbus' foremost partner and the world's favourite client, paying tribute to the company's commitment to timeframes of delivery and receipt deadlines and commending the directives of Sheikh Mohamed in modernising the company's fleet and providing all means of comfort, luxury and safety for all passengers from different parts of the world. Sheikh Mohammed, during the visit, expressed his satisfaction with touring the Hamburg plant and with getting briefed on the latest technologies adopted in arranging and finishing A380s as well as on the giant company's implementation of all that is needed in line with the agreement signed with Emirates. His Highness lauded the commitment displayed by the two companies to all terms and conditions related to the dates of delivery and provision of all means of comfort, luxury and safety for all passengers who prefer this unique type of planes. He hailed as well the efforts made by Sheikh Ahmed Bin Saeed and his close-follow up of all minute details related to the modernisation of Emirates' fleet which carries along with each of its flights messages of love and peace from the people of the UAE to the whole world. "I'm delighted with my visit to the Airbus plant in Hamburg after my first visit to the A380 Airbus plant in Toulous in the 1990s. During that time I was briefed on the mechanism of work at the plant's different departments and technologies used in the aviation industry which helps shorten distances between the peoples of the universe and brings closer world cultures, helping in inculcating principles of human, cultural, tourist and trade continuity and co-existence between peace-loving peoples," Sheikh Mohammed noted.